GUWAHATI/KOHIMA: Tropical cyclone Mahasen is expected to hit northeast India in the next 72 hours with heavy rains and thunderstorms expected in the region. 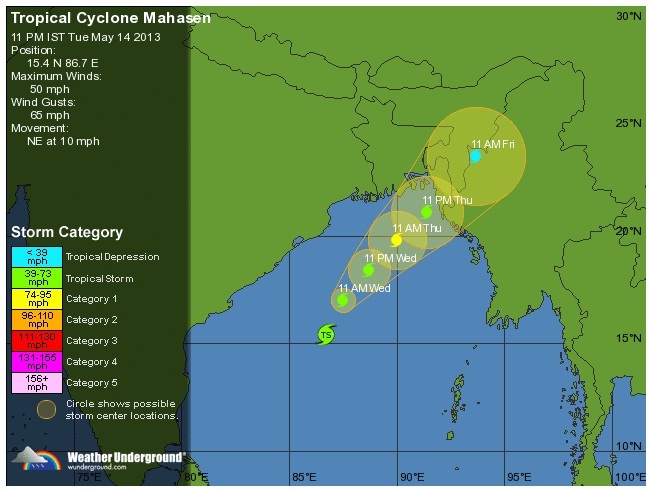 On May 16, the cyclone is expected to cross the Bangladesh coast between Khepupara and Teknaff, close to Chittagong. The cyclonic storm over the south-east Bay of Bengal moved northwards and lay centred near latitude 13.50 N and longitude 85.50 E, about 760km south of the port town of Paradip, the Centre said. The system would move northwards for some more time and thereafter recurve towards Bangladesh-Myanmar coast, it said. The NE could reel under heavy thundersqualls and Assam, Meghalaya, Nagaland, Manipur, Mizoram and Tripura are expected to be hit. As per the Indian Meteorological Department, heavy rain is expected in the northeast over the next three days. The region could also face heavy winds measuring from 65-75km per hour that could gust to 85kmph. On May 17, heavy winds measuring 50-60kmph gusting to 70kmph are also expected. Meanwhile, the Nagaland government has issued an alert on Mahasen. In an official statement, Nagaland home commissioner Temjen Toy called upon the public to be prepared for "expected severe weather conditions" following information that the tropical cyclone originating from the Indian Ocean was expected to hit Bangladesh and Myanmar coast. He said the cyclone would cause heavy thunderstorm/squalls in the northeast, including Nagaland, in the next 48 hours. Requesting the public "not to panic or spread rumours" but to stay alert, Toy said the state disaster response force has also been alerted for any emergencies. He requested the public to read the "dos and don'ts" issued by disaster management authority and the home department and be prepared for the expected inclement weather. Aizawl, May 15 : In the wake of widespread panic over tropical cyclone Mahasen that is said to be approaching Northeast India, Mizoram chief minister Lal Thanhawla told the people of Mizoram not to panic, but to 'pray more'. In an official statement, Lal Thanhawla said that as per his instructions the science and technology department was on 24-hour alert.